Introduction: The Shamwari Conservation Experience is a once in a lifetime chance to get behind the scenes and involved with the conservation efforts of the world renowned Shamwari Game Reserve. Shamwari is a fully operational reserve and the experience is based on the requirements of various short and long term projects and the need for assistance by the award winning Shamwari Conservation Department. Shamwari CNSV:XP boast a multi-purpose centre geared to get participants involved in various components of conservation. The experience is a true reflection of the day to day operational requirements needed to manage the game reserve. Shamwari have hosted grounded operations and experiences for the youth travel sector for a period that spans over the past eight years. We specialise in Conservation, with a focus on ecology, wildlife, and environmental education with local community and sporting interactions as part of our social responsibility drive. The programme is as safe as it is exciting as we move about in homologated game viewing vehicles only using suitably qualified guiding and conservation staff. We operate in a malaria free zone and are one hour away from the closest major airport, medical facilities and other amenities in Port Elizabeth. Location: Located about two hours drive from Port Elizabeth near the town of Grahamstown. Project: The Shamwari CNSV:XP for volunteers takes participants behind the scenes and exposes them to the several daily aspects involved in the conservation management of Shamwari Game Reserve. Participants are exposed to short and long term projects which are by outcome, intended to create sustainability for generations to come. Tasks may vary from being physical work to leisurely lecture based interactions. There are several monitoring projects which assist in capturing vital information used in the research and management of all species on reserve. The experience is diverse and unscheduled as result of the reliance on prevailing conditions. Visits and tasks at the Born Free Foundation and Shamwari Animal Rehabilitation Centre are undertaken according to the requirements at time of stay. Weekend activities are at leisure with participants opting to stay on site or rather travel to partake in various off site adventure and other activities at own cost. This experience is generally operated from a roofed accommodation block with proximate mess and lounge common areas. Average stay is between 2 to 12 weeks, with recommendation of a longer stay for a more complete experience. Animals: Shamwari probably has the largest selection of Game in one Reserve in South Africa from the Big 5 to a selection of Big Cats. Accommodation: The purpose build student centre is situated in close proximity to the main reserve on one of the management properties of the conservation department. General game including zebra and Kudu can be found along with buffalo on the property. Telephone service making use of World Call Card system ï¿½ can be purchased locally. Seven spacious tented accommodation sleeping 3 sharing with en-suite shower, toilet and wash basin facilities per tent. Cupboard storage space, desk and chair for study per person. Three meals are provided on a daily basis. Meals will either be served at the facility itself or taken as a pre-packed serving, depending on planned or as result of unscheduled activities. Vegetarians and other dietary requirements can be catered for, if notified in advance. Cooked breakfasts are served once weekly ï¿½ generally Fridays. There are no facilities to service Kosher or Halaal requirements but the supply of such meals can be serviced at extra cost, request and availability. Meals are prepared with exposing participants to an array of local dishes in mind and are generally taken on a self-service basis with the option of juice, tea or coffee being available. Bottled still and spring water is available for purchase from local trading stores. With regular monitoring it is possible to identify individuals, compile information about the family structure and determine feeding and special ecology. Data collected is used to assist in the managing decisions for the reserve. Annual game counts are conducted to establish the carrying capacity of the reserve. Game counts assist in the decision making of predator to prey ratios and the movement of animals on or off the reserve. Monitoring of some high profile animals like cheetah and leopard are required using telemetry tracking equipment as result of the neighbouring properties carrying livestock and the elusive nature of some of the species. The need to return the once pristine landscape to its original splendour includes the likes of collecting and removal of old fence lines and rehabilitating degraded and overgrazed land. Management of breeding centre can include anything from veld (open country or grassland) conditions assessment, mapping of breeding area, mapping of alien vegetation, monitoring animal numbers and managing water points. Alien plants were introduced to the land by the farmers for different reasons and uses. Today these invasive plant life need to be removed to increase the natural biodiversity and decrease fire risk. Shamwari Animal Rehabilitation Centre was set up to aid in rehabilitating injured animals found on the reserve and surrounding community. The aim is to give the animal short term care and release it back into the environment. Volunteers are sent when and if assistance is required. The centre is not a sanctuary as no animals are kept for purposes of breeding in captivity but are hosted with the aim of giving them a second chance to take on life back in the wild. The centre boasts avian, small and large stock boma (enclosure) areas which house the various species which may find their way to Shamwari. Participants may gain different types of exposure through this experience which dependant on the needs and requirements of the operation and may range from assistance through observation to more hands on animal care and husbandry. The present role of conservation does not stop at conserving nature alone but also include the responsibility to uplift the local community. This responsibility includes education the community as to the role and benefit of conserving biodiversity and stresses the importance of conserving our natural recourses. Weekly trips are made into the local community to assist in various community projects that range from creating and maintaining vegetable gardens and recycling projects, to painting class rooms. Hours: The program generally runs in-week from Monday to Friday or as is required by the operations of the reserves conservation efforts, so participants are asked to assist and conduct related weekend duties from time to time. By time schedule, operations run on an 8H00 to 17H00 basis with the need for early morning or late night activities dependent of the tasks at hand at the time of stay. Freetime: The program generally runs in-week from Monday to Friday or as is required by the operations of the reserves conservation efforts, so participants are asked to assist and conduct related weekend duties from time to time. By time schedule, operations run on an 8H00 to 17H00 basis with the need for early morning or late night activities dependant of the tasks at hand at the time of stay. Evenings and weekends are however generally at leisure. 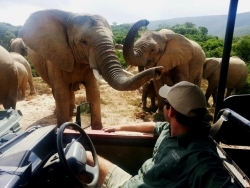 This opportunity can be used to explore the Eastern Cape and surrounding biodiversity and the several other leisure based opportunities which include the likes of elephant back safaris, bungee jumping and surfing lessons. Volunteers Feedback: I recently spent six weeks on a volunteering programme connected with the Shamwari game reserve. The accomodation is based about a ten minute drive from the main reserve. The working day starts at 8am and finishes at 5pm, the days are spent in the main reserve monitoring and tracking the animals, helping with game capture and research. The programme is also involved with helping the local school and creche in the nearby town of Paterson. The highlight of my experience was helping with the game capture, once the animal was sedated the vet allowed us to be hands on and help out if it was needed. If you are looking for a safari experience with added extras then this might be for you. The longer you stay the more chance you have of experiencing most of the activities that occur on the reserve. The three coordinators are all very nice, informative and fun to be with. We had shared accomodation, (two per room), although the rooms are basic they are clean and the beds are comfortable. Each room has ensuite shower and toilet. Three meals a day are provided, the meals were not always good, some days were better than others. The chef is a lovely young lady who always tries her best to cook tasty meals, she would always ask what meals we liked and didn't like, unfortunately she can only work with the food she is provided with. Bear in mind that this programme is based in the middle of the bush, it can feel isolated to start with but you soon get use to the surroundings and the peace. Extra funds are needed for transport out of the reserve, I spent two weekends away and this cost me around Â£120.00 for taxi hire and ovenight stay, so bring extra cash to allow for transport outside of the reserve and taxi fares to the nearest pub, this is an added cost which is not included in the price of the trip. If your are looking to get out of your comfort zone and experience a day in the life of a ranger without posh food and accomodation then this could be for you. If you like to be pampered, go shopping and live it up at the Ritz then this is definately not your scene. This listing has been viewed 2688 times.